I blog about the things I breathe: social work, technology, family-centered child welfare practice, the Indian Child Welfare Act, Motivational Interviewing, and social work education. Hey friends! I've made a big move to the University at Buffalo SUNY, where I have joined the faculty as a tenure-track Assistant Professor. I'm really excited to be here at this vibrant School of Social Work in this great community. University of North Dakota (my colleagues, students, community partners) will always have a special place in my heart. And because I started so much work in North Dakota, I will hang on to some of it. I continue to lead the North Dakota Indian Child Welfare Act Partnership Grant as Principal Investigator, and will visit in person several times a year. And on the self-care front, I am really jazzed to hang out at some craft fairs, farmers markets, the WNY Book Arts Center, and at the dog park. Which I am sure I will have time to do after I unpack all the boxes covering my house. Moving is a lot of work! Hope you're all off to a happy and productive Fall! I am near lovely San Diego in California, my home state, learning at the NICWA annual conference. If you know me, you know that I care deeply about child welfare issues, and especially that children stay connected to their families. The Indian Child Welfare Act is a federal law that requires child welfare systems to carry out special efforts to keep children connected to their families and tribes, and part of my work is about helping systems make improvements in this area. If you have questions about any of our resources, please feel free to contact me: Melanie.Sage@und.edu or 701-777-1224. Thanks! Hello everyone! I am just back from the SWDE 2016 Conference, and it was great. 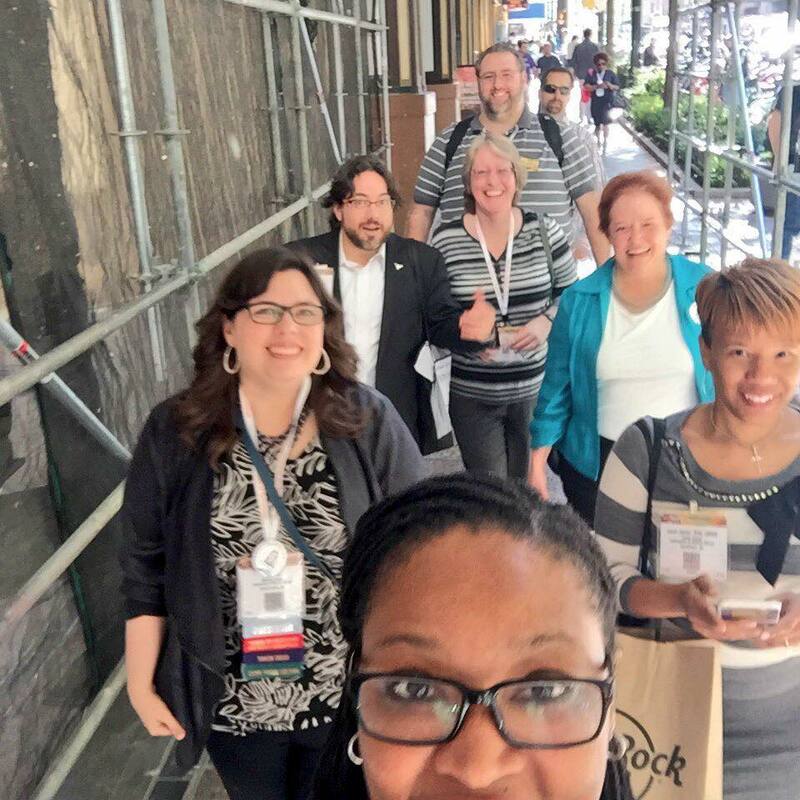 My favorite part was hanging out with so many wonderful colleagues. Amazing spirit of support for imagining new ways to deliver and assess distance education. There was also a pretty good twitter crowd, which allowed me to see what was going on at the sessions I didn't get to- and you can see that feed, thanks to Sean who attended via Twitter from his home in New York! My friend Laurel presented a great session about using Twitter if you've not jumped in to that water yet, and you can find her tips here. 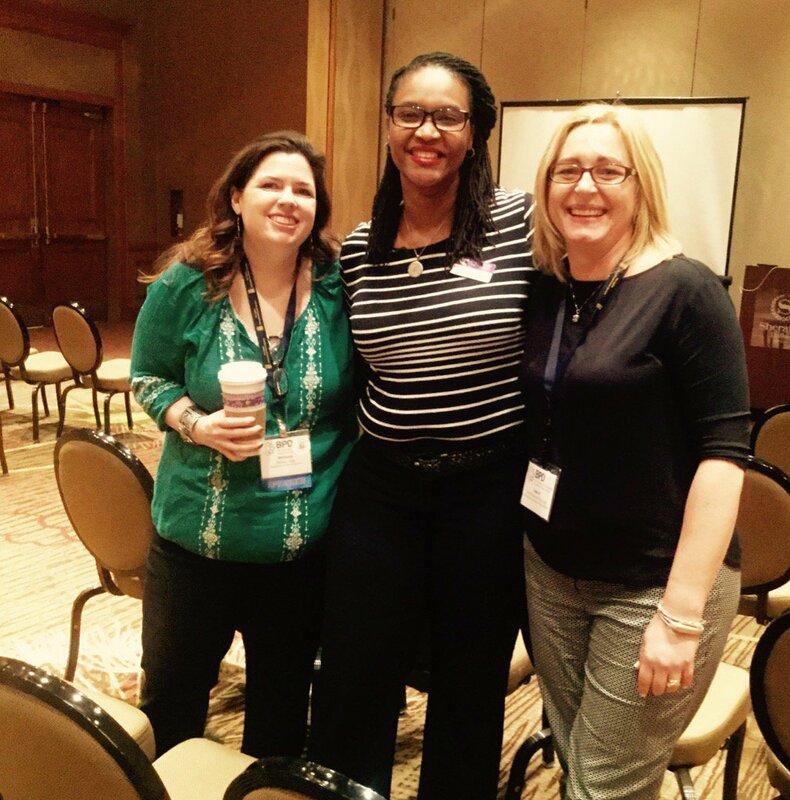 At SWDE I presented one session about integrating tech in social work practice with my great colleagues Laurel and Nancy. 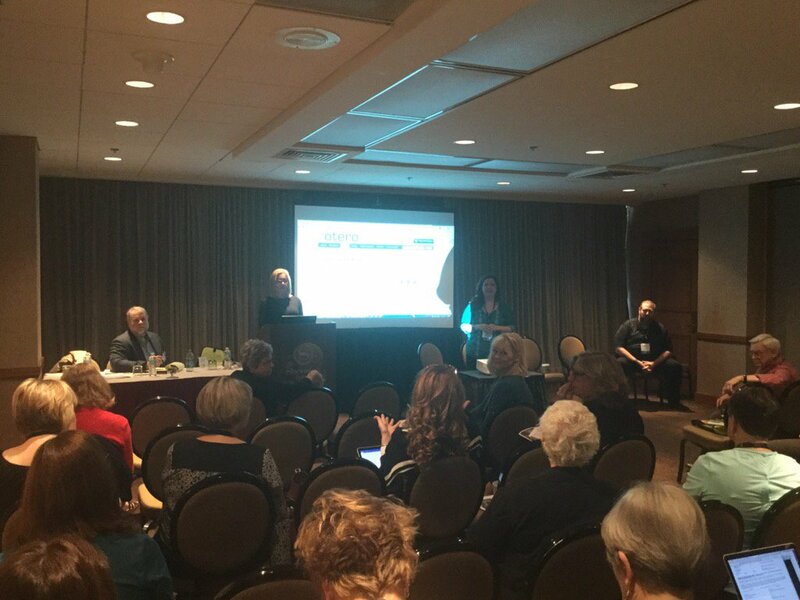 We are writing a book together about integrating technology across the social work curriculum, and this presentation allowed us to offer a preview of what we've been working on. The three of us met via Twitter and we are having a lot of fun together. Laurel did a great write-up of our presentation here, including a downloadable version of our powerpoint and a collection of assignments that we've put together. I also presented about social media policies with other fab colleagues Melissa and Todd. We talked about how important it is for social work professors to train students for professional identities online. We discussed why we need to teach students to build and assess policies related to social media use, and how to think through ethical dilemmas. These issues are impacting us all now, but we've had a slow professional response. Here's our handout on some assignments you can try in class, along with a policy analysis framework we use. The whole ppt presentation is here. In the presentation, we shared some data about a survey of child welfare workers we conducted. A paper about those data will be published at Advances in Social Work in the upcoming weeks. You might also want to check out our paper on Social Media and E-Professionalism in Child Welfare, published in the Journal of Public Child Welfare last year. We also created a short handout for child welfare workers- feel free to share. I'll share more soon about some other work I'm up to- it's been action packed around here. One thing I'll never claim- that I'm bored. There's too much good stuff! Thanks for coming by! I am at the BPD Conference in Dallas, TX with BSW educators from across the nation. It's so fun to see friends, make friends, and hear new ideas for teaching and research. I was involved in several sessions and told people I would share resources here. This morning as part of the technology committee, I promised to share my student tutorial for using Zotero. Here you go! This is a youtube link to the video. Feel free to share with your students. Laurel Hitchcock and I talked about how we met online, and are now writing a book together (with Nancy Smyth!) about using technology in social work education. We've used lots of tools for collaboration, including Zotero, MindMeister, and Dropbox. Laurel is one of my favorite colleagues, and our story is a great example about how online communication yields real authentic relationships, connections, and collaborations. In the early afternoon I presented with Todd on development of professional social work identity in online space. Here's a link to the powerpoint we shared. If you look at it in "notes" view you'll see a lot of our talking points which offer up additional tips. Warning: the file size is huge because I embedded all those cool video contributions. If you want to watch a video of the whole thing, go to this youtube link. Feel free to share this information, and let us know if you have questions or need resources. 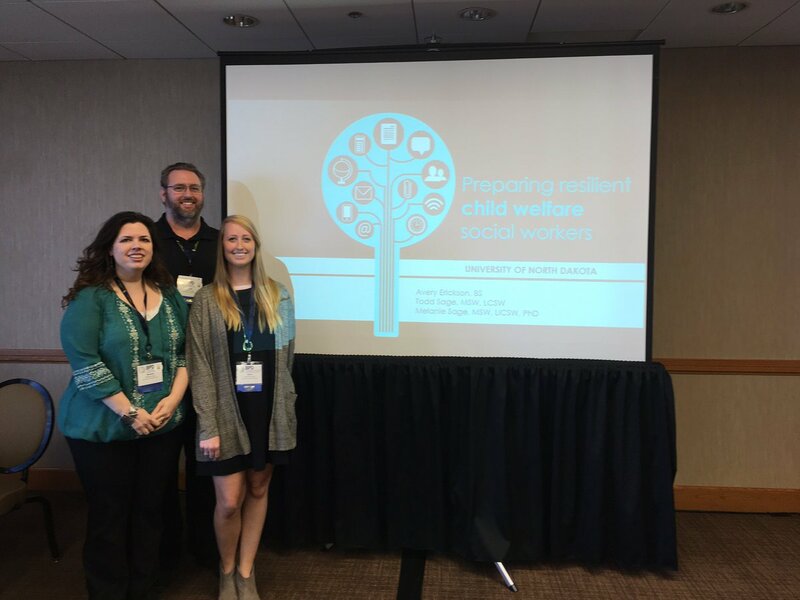 In late afternoon I presented with Todd and Avery about our work on the National Child Welfare Workforce Institute grant, where we're working on supporting child welfare scholars in social work education. Here's the ppt presentation we shared. I come home from these meetings tired but excited to try new things. So nice meeting all of you- thanks for learning with me! I am collecting data to help us better understand the ways in which child welfare workers use social media and the kinds of benefits, needs, and concerns they express about its use. I would be most grateful if you would consider completing the survey if you are a current child welfare worker. If you can pass it on to colleagues that would also be great. I am conducting a study to learn about the experiences of child welfare workers related to social media. This survey takes approximately fifteen minutes to complete, and will help us understand the current use, agency policies, and needs for training related to social media sites like Facebook and Twitter. In the survey, participants are asked about their current use of social media, where they access social media, what kind of education they have received related to social media, about the policies and practices of their agencies, and about their opinions of appropriate social media use. We ask that survey participants are currently child welfare workers or completing a university-supervised field placement in a child welfare setting. If you are a child welfare administrator and a professor, please consider passing this survey along to your employees/students in child welfare settings. If you feel that sending this survey link to your students constitutes your own participation in research, you should consult with your IRB about your institution’s requirements. What do you know about the Indian Child Welfare Act (ICWA)? If you work in the legal system or with families, it is important to know about ICWA. If you are a human who cares about our history and our future it is important to know about ICWA. If you do not understand why it is important that we need ICWA then it is important to know about ICWA. The Indian Child Welfare Act was passed in 1978 to protect families experiencing many years of unjustified mass removals from their children from their homes. Without children, the future of any culture is fleeting. Sadly, American Indian children are still removed disproportionately from their families. My current work in supporting our State Supreme Court in assessing and improving ICWA compliance has me doing a lot of reading about ICWA- current and historical practices- and the more I know the more clear it is that we are not doing enough to educate people who should know about the provisions, practices, and reasons for the Indian Child Welfare Act. Please share this infographic to help bring attention- plant a seed of knowledge . The National Indian Child Welfare Association does great work in training and education- please also see their website for great resources. You may have noticed a new page tab at my blog: I have added some tips for studying for the ASWB Social Work exam. Good luck! This infographic uses data collected from an online survey of students and practitioners around the US. I conducted this study along with colleagues- see citation at bottom. How do you write a social work abstract? Here are some examples. I have just returned from the Council on Social Work Education's Annual Program Meeting, one of the key conferences of my profession. I presented in three different sessions with my colleagues. If you were at the conference, and - like me- you wish you could have been in five sessions at once, you may have missed my presentation. So I am sharing abstracts for the presentations below, with links to the pages of my colleagues, where applicable, and links to the powerpoint presentations as well. If you are a student or perhaps preparing your first conference abstract, here's a peek at the info we submit to the conference for review. Overview: Social workers are using social media as an augment to direct service provision, often with little guidance. This paper reports on students’ professional use of social media, and on policy that specifically addresses social media use in agency settings. Implications for training and policy development are discussed. Social workers and other professionals are increasingly using social media in their professional lives to serve clients. They use social media to seek information about clients (DiLillo & Gale, 2011; Tunick, Mednick, and Conroy, 2011), as a way to communicate with clients (Hawn, 2009), through the use of social-media supported interventions (Bull, Levine, Black, Schmiege, and Santelli, 2012; Cavelo et al., 2012), or as a way of reflecting, debriefing, and advocacy (Hickson, 2012; Baker, 2012). Social workers and employers alike must understand social media for its potential risks and benefits in providing direct services to clients. They may also have obligations to educate clients about privacy on social media sites (Fitch, 2012; Hinjuda and Patchin, 2008; Kolmes, 2010). Social workers and agencies should also understand the potential benefits to clients who use social media, such as enhancing social connections (Baumgartner and Morris, 2010; Wolf-Branigin, 2009). Although the ethical dilemmas encountered in online settings mirror those that are experienced in face-to-face settings, the ease of access to personal client information raises new questions about how and when to use social media as an adjunct to practice, and the role of the agency in supporting, limiting, or creating policy around its use. Although NASW maintains presence on Twitter, Facebook, Linkedin, Youtube, and its Social Work Blog, the professional organization offers no policy guidance on individual or agency use of social media, and has not adopted specific guidelines around its use, regardless of the trend in other professional practice organizations (e.g., ASHP, AMA). The American Society of Health-System Pharmacists (ASHP) has a statement on Use of Social Media by Pharmacy Professionals which offers recommendations for healthcare agencies about balancing the benefits with the liabilities of professional social media use. The American Medical Association offers similar guidelines, but includes a statement on maintaining appropriate patient-physician boundaries. Despite the location of organizational level policies, it appears that no policies exist related to the use of social media in the nonprofit settings (Joselyn & Panepento, 2010). Once policies are developed, it is imperative that future social workers have the competencies in using social media so that the client is best served. As a result, this study purpose was threefold: first, to offer a case study of one agency’s attempt to develop policies about social media use, and second, to present the results of a survey with students currently involved in field practicum concerning their current practices, knowledge, and beliefs about accessing information about clients on the Internet. Thirdly, this study also surveys social service administrators about their current explicit and implicit policies for practitioners related to social media. Results: Largely in line with the previously cited studies, no agencies had explicit policy guidelines related to the direct practice use of social media with clients. The students displayed a broad range of personal use of social media, and some had ventured to use it related to agency work. Very few students had considered the use of multiple social media profiles, largely not considering the possibility of having a professional profile AND a personal profile. The students’ use of social media in regards to working with clients was largely mirrored by agency administrators (i.e., it was not encouraged nor was there training provided on how to do so). However, students were even more restrictive in their views of possible uses for practice. In both populations, they tended to frame the use of social media from their own perspective, and did not acknowledge a client’s volitional choice to use social media as a mode of communication, thus perhaps disempowering the client in the process. Relatedly, neither population noted the need to train agency clients on how to use social media. Ultimately, social workers are obligated to develop competency in the use of technology and the ways that it benefits service delivery or augments treatment for clients. Therefore, our results will be used to identify competencies to guide best practices of social media use. Furthermore, the results will be used to present suggestions that can be used by agencies in developing social media guidelines. American Medical Association (2011). Opinion 9-124 - Professionalism in the use of social media. Retrieved from http://www.ama-assn.org. American Society of Health-System Pharmacists (2012). ASHP statement on use of social media by pharmacy professionals. American Journal of Health-System Pharmacists, 69, 2095-2097. Baker, L.A. (2012). Social media for housing and community development agencies. Journal of Housing & Community Development, July/August, 19-23. Baumgartner, J.C., & Morris, J.S. (2010). MyFaceTube politics: Social networking web sites and political engagement of young adults. Social Science Computer Review, 28, 24-44. Bull, S.S., Levine, D.K., Black, S.R., Schmiege, S.J., & Santelli, J.(2011). Social media-delivered sexual health intervention: A cluster randomized controlled trial. American Journal of Preventitive Medicine, 43(5), 467-474. Cavelo, D.N., Tate, D.F., Ries, A.V., Brown, J.D., DeVellis, R.F., & Ammerman, A.S. (2012). A social media-based physical activity intervention: A randomized controlled trial. American Journal of Preventative Medicine, 43(5), 527-532. DiLillo, D.K., & Gale, E.B. (2011). To Google or not to Google: Graduate students’ use of the internet to access personal information about clients. Training and Education in Professional Psychology, 5(3), 160-166. Fitch, D. (2012). Youth in foster care and social media: A framework for developing privacy guidelines. Journal of Technology in Human Services, 30(2), 94-108. Hickson, H. (2012). Reflective practice online- Exploring the ways social workers used an online blog for reflection. Journal of Technology in Human Services, 30(1), 32-48. Hinjuda, S., & Patchin, J.W. (2008). Personal information of adolescents on the Internet: A quantitative content analysis of MySpace. Journal of Adolescence, 31, 125-146. Joselyn, H., & Panepento, P. (2010, Jan 6). Few charities have social-media policies, survey finds. The Chronicle of Philanthropy. Retrieved February 15, 2013, from http://philanthropy.com/article/Few-Charities-Have/63591/. Kolmes, K. (2010). Social media in the future of professional psychology. Professional Psychology: Research and Practice, 43(6), 606-612. Tunick, R.A., Mednick, L., & Conroy, C. (2011). A snapshot of child psychologists’ social media activity: Professional and ethical practice implications and recommendations. Professional Psychology: Research and Practice, 42(6), 440-447. Wolf-Branigin, M. (2009). New media and social networks: Considerations from clients in addictions treatement. Journal of Technology in Human Services, 27, 339-345. Overview: Flipped Classroom techniques are activities in which “events that have traditionally taken place inside the classroom now take place outside the classroom and vice versa.” This research explores the use of Reading Reflection Journals as a Flipped Classroom technique. Social work students using this technique report improved reading and engagement. Participants will understand the definitions and emerging practices related to Flipped Classroom techniques. Participants will learn an overview of the evidence-supported benefits of using Flipped Classroom techniques. Participants will learn the procedures of using Reading Reflections as a Flipped Classroom technique, and be able to name themes related to student feedback of a pilot study that utilized this approach. Students in social work practice courses come to class with varying levels of educational, life, and practice experience. Reading adherence varies widely between students, which makes it difficult to progress toward discussion without some class review of the assigned reading. Bloom’s Taxonomy identifies six levels of learning, ranging from “lower-order goals” like memorization (defining, naming, stating) to “higher-order goals” such as evaluation (rating, defending, predicting) (Houston and Lin, 2012). Critical thinking and problem solving are higher-order goals that are most applicable to the work lives of social workers. Review of the reading material in class limits the amount of time for critical discussion and application, especially if it is the student’s first exposure to the concepts. Using a Flipped Classroom technique allows instructors to spend more time modeling, watching, and correcting as students apply concepts in the classroom. Flipped Classroom techniques, sometimes also called inverted classroom (Gardner, 2012; Lage, Platt, & Treglia, 2000; Talbert, 2012), upside-down or backward classroom techniques (Houston & Linn, 2012), are described as activities in which “events that have traditionally taken place inside the classroom now take place outside the classroom and vice versa” (Lage, Platt, & Treglia, 2000). Talbert (2012) notes that using a Flipped Classroom method shows promise for making the university classroom experience more interactive, inclusive, and effective. In the Flipped Classroom, students focus on concepts, definitions, and traditional knowledge as “homework” so that classroom activities can be spent on applied learning, problem solving, and discussion (Gardner, 2012). Websites such as TEDtalks and Kahn Academy have popularized this model by designing teaching components that allow instructors to assign homework based on brief video segments where students learn the basic instructions on their own by watching the videos, and then get the opportunity to practice the techniques in a teacher-facilitated class. In higher education, instructors create their own media or homework assignments such as videos or PowerPoints so that classroom time can be spent on deeper discussion and practice application. Instructors are then able to see whether students understand material by watching them attempt to apply it in practice during group work and interaction (Houston and Lin, 2012). Reflective journals can be used as a Flipped Classroom technique if the journal assignment requires students to explain key concepts and reflect on application of them. Reflective journals have empirical support for their ability to foster clinical judgment (Lasater,2009), encourage students to articulate their thinking (Fogarty & McTighe, 1993), and to enhance self-reflection to foster personal growth (Blake, 2005). Through the in-class sharing of student journals, students further have the opportunity to gain the perspective of others and guide the direction of the class discussion toward what they most need to know. This research explores a Flipped Classroom technique designed to help move lower-order goals out of the classroom so that class time can focus on reflective exercises which contribute to life-long learning (Brandsford, 2000). By requiring a structured reflective journaling homework assignment in which students were asked to reflect upon the reading and consider application of the material, it was hypothesized that students would have higher reading adherence, think more critically about what they had read, and be more prepared to practice once they arrive in class. Additionally, by incorporating their Reading Reflections in a PowerPoint to guide class discussion, we hypothesized students would be more engaged, feel like their questions about the context were better answered, and that it would be possible to engage students who might not normally talk in class. Each week, students were asked to journal about three questions relative to the reading: (1) What did you learn; (2) What do you still have questions about, and (3) what personal or professional connection can you make to this topic? Using a Likert-type scale and open-ended questions, students reported on their experiences about how Reading Reflections contributed to their learning and classroom preparedness. Participants included 28 students in two courses. Ninety-two percent of students said that Reading Reflections helped stimulate class discussion and 85% reported that their reading adherence improved. They report they were more engaged and better prepared because of the Reading Reflections, and were more likely to ask questions about the material. The instructors noted more representative student participation, preparation, and engagement. However, the work was more time consuming for students and instructors. Other findings and implications are explored in this presentation. Techniques for using Reading Reflections and examples of student work are shared. Student and professor perspectives on the strengths and weaknesses of the technique are discussed. Blake, T.K. (2005). Journaling: An active learning technique. International Journal of Nursing Education Scholarship, 2(1), 1-10. Bransford, J. (2000). How people learn: Brain, mind, experience, and school. Washington, DC: National Academy Press. three-story intellect. Theory into Practice, 32(3), 161-169. Houston, M. & Lin, L. (2012). Humanizing the Classroom by Flipping the Homework versus Lecture Equation. In P. Resta (Ed. ), Proceedings of Society for Information Technology & Teacher Education International Conference 2012 (pp. 1177-1182). Chesapeake, VA: AACE. Lage, M. J., Platt, G. J., & Treglia, M. (2000). Inverting the classroom: A gateway to creating an inclusive learning environment. The Journal of Economic Education, 31(1), 30-43. Lasater, K., & Nielsen, A. (2009). Reflective journaling for clinical judgment development and evaluation. The Journal of Nursing Education, 48(1), 40. Talbert, R. (2012). Inverted classroom. Colleagues, 9(1), 1-2. Social work educators face a curious dilemma when it comes to technology. Students, administrators, and the social work profession have an expectation that educators will use technology in the classroom to both enhance learning as well as to prepare students to use technology in their social work practice (Coe Regan & Freddolino, 2008; NASW, 2005; Perron, Taylor, Glass, & Margerum-Leys, 2010). Students expect educators to use social media to augment learning (Roblyer et al., 2010). University administrators, in an effort to increase revenue via increased enrollment, are putting increased pressure on schools of social work to offer online or hybrid courses. And the social work profession has established guidelines for the use of technology in practice (NASW, 2005). Yet, these same constituents have an expectation that social work educators will use technology thoughtfully. Straub (2009) points out that thoughtful integration of technology considers how and why faculty members adopt new tools, as well as the benefits these tools potentially offer to learners. Given the speed with which computer technologies, particularly social media/networking sites such as Facebook, Twitter, and Pinterest, emerge and evolve, even the most tech savvy social work educator can feel overwhelmed keeping up with today’s technologies, let alone thoughtfully incorporating them into his or her teaching. It comes as no surprise, then that, with the exception of online social work education programs, technology is integrated into social work education sporadically (Gorder, 2008). How can the profession of social work education be more intentional and planful about integrating technology into social work education? The critical pedagogist, Stephen Brookfield (1995), suggested that educators can look to four sources for critical feedback on their teaching: the scholarly literature, their students, themselves, and their colleagues. The scholarly literature on integrating technology in social work education is in its infancy. Educators who turn to the literature find articles that include the qualifiers, “exploratory,” “new approach,” and “emerging trends.” When educators look to their students, they are often bewildered at the mixed message of “I want more access to online resources” and “I don’t know how to use computer technologies” (Allwardt, 2011). When educators do honest self-assessments of their comfort with and interest in technology, they take an important step in addressing this dilemma (Coe Regan & Freddolino, 2008). 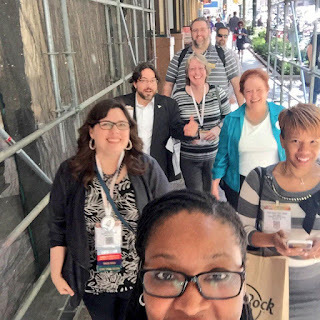 Many educators would love to turn to their peers, but anecdotal evidence suggests that most schools of social work have only one or two educator(s) who are the “tech experts.” With the exception of the Technology Special Interest Group at APM, educators have had almost no formal opportunity to come together and develop strategies for integrating technology into social work education. We believe that this area is a promising, yet mostly untapped, resource. The purpose of this Think Tank is to provide educators with the opportunity to discuss and strategize ways of incorporating social media/networking technologies into social work education. The final product will be recommendations and practical steps that will help educators of varying comfort levels with technology, and whose schools provide varying levels of support and resources, integrate social media/networking technologies into their teaching. This discussion is led by four social work educators who have integrated technology (including social media/networking) into their teaching, have conducted research on the use of technology in social work education or practice, and have provided trainings to practitioners, educators, and students on the use of technology. What are the benefits to using social media in social work education, and what successful strategies are professors already using to harness these benefits? What are the barriers to using social media, including individual, school, and professional-level barriers? What are the responsibilities of faculty to educate students in the use of social media for practice? How can social work educators use social media to model ethical use of technology for their students? Describe how social media applications can be used in social work education. 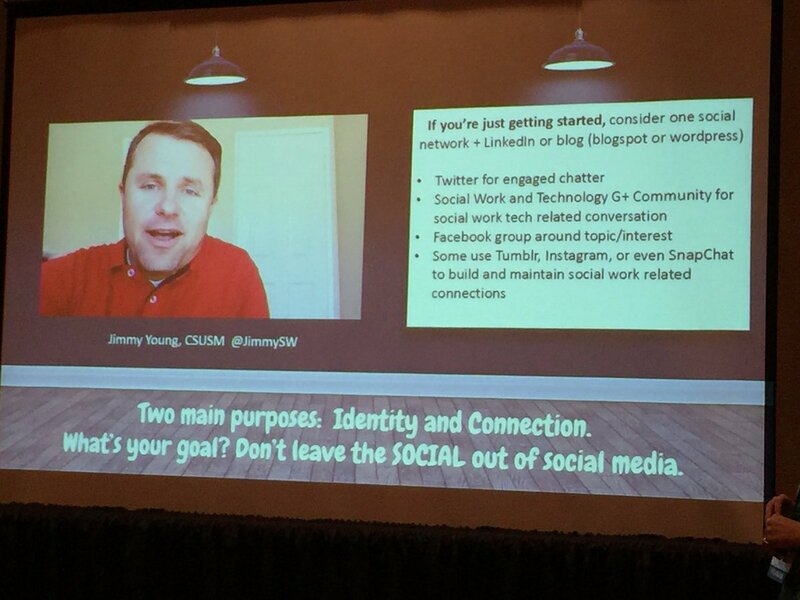 Identify three strategies for implementing social media into social work education. Discuss barriers and facilitators to using social media technology in social work education. Overview: Educators have used APM to present innovations in the use of technology in education. This Think Tank offers educators an opportunity for structured discussion and debate around strategies for integrating commonly used social media platforms into every day social work education. Everyone, from social media beginner to expert, is welcome. Coe Regan, J. A., & Freddolino, P. P. (2008). Integrating technology in the social work curriculum. Alexandria, Va: Council on Social Work Education. Perron, B. E., Taylor, H. O., Glass, J. E., & Margerum-Leys, J. (2010). Information and communication technologies in social work. Advances in Social Work, 11(1), 67-81. My last post on social work salaries was based on NASW data and represented mid-level workers from all groups. The map below offers some random salaries in the child welfare field gleaned from current job openings across the United States. Some states have title protection, which means that people can only call themselves social workers if they hold a social work degree. In states that do not exclusively hire degreed social workers in the child welfare positions, the child welfare job titles are often "Social Service Worker" or something similar. Child welfare workers often get 1-3% annual increases for cost of living or "step" raises, and some jurisdictions offer several different levels of employment that workers can promote in to. Annual Salaries may range, over time from the low 30k to the high 70k depending on years of experience. Benefits also vary widely; child welfare workers may have to contribute several hundred dollars to family medical benefits per month, while others may have their benefits fully paid by their employer. I am a big advocate of child welfare work as a career path, and also an advocate of the needs of child welfare workers. I worked in the child welfare field for many years, and interfaced with the community at every level; I made good contacts, got good at assessment and engagement, and worked with people in their environments during some of the hardest moments of their lives. It is very rewarding work, and the policies and supports of the employing agency make a very significant difference in retention and satisfaction of workers (and thus the quality of services for clients). I believe that professionally trained social workers are uniquely prepared to do this kind of work, and that salaries will increase where the work is professionalized. There is little agreement about entry requirements for the work across the nation, and many states do not differentiate work tasks between Bachelors and Masters level preparation; therefore, the rewards for continued education are low, and the enhanced skils of MSW-trained workers may not be recognized. I collected the data below from current job ads. If you are a child welfare worker and inclined to share (and feel free to post anonymously), post your salary, years of experience, job title, employer, and degree in the comments below to give us a wider idea about child welfare worker salaries. If you have any corrections for my infographic below, please send me an email. Visual data display in the form of infographics are popping up all over the internet, for good reason. They give you a quick glimpse of take-away facts. Pictures help us remember information. Certainly it's more interesting to look at pleasingly-displayed factoids than to read an entire research article. One of my goals for the new year is to get better at sharing visual data, especially in my own research and collected data, because it is one way to help move research to practice- to get people sharing and enthused about specific findings. 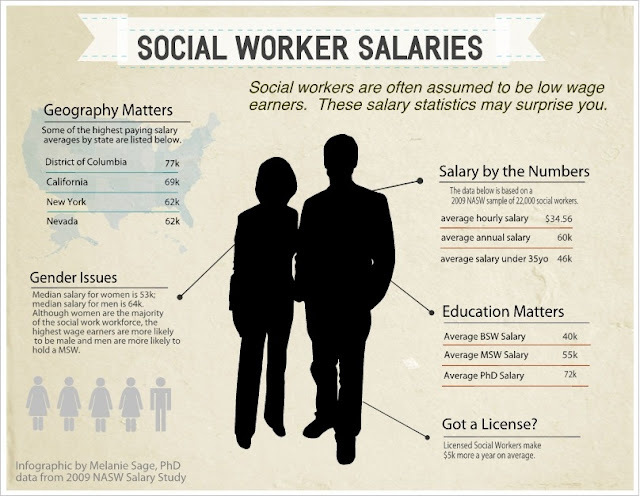 I stumbled upon a tool for creating an infographics and put together my first one using NASW Salary Survey data. I chose this data because of my interest in workforce, and also because it helps dispel a popular myth- that social workers take a vow of poverty out of their love for people. I suspect some of my blog readers will stumble on this and guffaw at the idea that $34 an hour is the average social work salary. If you want to know more about participants and polling of this sample, please have a look at the NASW report, based on 2009 data of over 20,000 social workers. Also keep in mind that this is not an average starting salary ($43k is the average salary for those with under 5 years experience polled in this report)- this is the average of all people polled, with varying positions and levels of experience. It appears that all participants were members of a professional organization (NASW or another expertise-specific group); we might assume that social workers who pay professional dues are more likely to be among the higher earners or more professionally engaged. Only data from fully employed workers is reported. All levels of the degree (BSW, MSW, PhD) are reported together to obtain the $34 an hour mean, but data are broken down separately in the report by education level, field of social work, age, experience level, and other criteria. Some of my research friends don't know that in my former life (20 years ago) I started a rubber stamp company where I designed and produced art rubber stamps. I made and sold stamps for many years, in fact, travelling to conventions all over the US with my wares, selling to shops all over the world. The ability to play with data and graphics speaks to the creative part of me that still enjoys this visual way of expressing my creativity and ideas. After trying out the easel.ly site, I am most likely to take a stab with photoshop for my next infographic- the available graphics and design themes are limited at the slightly clunky site, and this small graphic took about four hours to create but this was a good way to dip my toes in the water. Feel free to share it and let me know what you think. What other social work issues would you like to see infographic'ed? Did this data surprise you? Did it make you want to know more about the research? 1. Professional advocacy: I recently joined the BPD Technology Committee. BPD is a group that focuses on undergraduate social work education. As part of this group, I give input regarding recommendations about how to share information about technology with other educators. I will present on some ways to use technology in the classroom at the 2013 BPD Conference in South Carolina. I have also recently been elected to the HUSITA board. HUSITA is a group that focuses on promoting the ethical use of technology in human services. 2. Research and dissemination: In January 2013, I am presenting a two-hour workshop at the Society for Social Work Research (SSWR) on the ways that I have used technology to support research fidelity. As the evaluator of a federal grant on Family Group Decision Making, I have developed videocasts and blog resources to help support the way that we conduct research and evaluation of an intervention project. At the conference I will share these methods with other researchers. I will share technology I am using, such as jing, blogger, and other tools, and talk about how they have benefited our work. 3. Classroom activities: I have posted before about how I am using videocasts in the classroom to share intervention techniques in children's mental health. This is a fun project for a lot of reasons; it allows students to contribute to professional development of each other; it is a resource that we can share with other professionals; it is applied work that ties research to practice; it allows students to learn new technological skills. They squirm quite a bit about having to record themselves, but it is one of my favorite assignments. Last semester I started using a new technology-enhanced assignment related to "flipped classroom" theory. I am using journaling on blackboard as a way to get feedback about questions before class so I can incorporate student's questions directly in to the class lecture. We focus more on questions, discussion, and practice in class and spend less time doing "chapter review." Through technology, I am able to help make sure students are reading outside of class so we can have richer discussions in class. 4. Publications: I am currently working on a few technology-related publications, including a review of all the things a professor must think about when inviting a guest speaker in to the classroom via distance technology (there's a lot to think about! ), as well as a research article related to the flipped classroom technique that I mentioned previously. When we use new tools and techniques we have to share the outcomes! 5. Podcasting: I am very excited about my podcast in the works. I have many hopes and dreams about this work, and it is a creative project that stimulates lots of parts of my brain! This podcast will focus on research-to-practice in child welfare. I will interview people who do research and intervention in child welfare in a way that is approachable for child welfare workers in the field. Child welfare workers spend a lot of time in the car, so I hope they'll download episodes for the road and learn about best practice that is coming out of research. I was a child welfare worker for many years, and it is work that is close to my heart. My hope is that eventually I will be able to offer continuing education based on the podcasts. I would like to post short tours of child welfare agencies across the country- child welfare environments look so different from place to place. I hope it also encourages a broader understanding of what child welfare work is (and isn't) and might attract more social workers to the important field. The first episode will launch in Jan 2013, and I am lining up interviews with researchers across the country. The Children's Mental Health Intervention blog has been updated with another semester of evidence-based interventions demonstrated by my graduate students. I am posting Jenna's fine work below; she is a forensic interviewer. Click on this blog link to see more! Here is a short video about how to use Google Scholar to find research articles for social work. A new study reports that 37% of college students who seek help report severe psychological problems, which is more than twice the rate of a similar study in 2000. Counselors report that self injury and eating disorders both appear on the rise. Suicide is reported as the second leading cause of death among college students after accidents. The article above reports that University of North Carolina-Chapel Hill's incoming freshman will be required to read a book on how the internet contributes to feelings of loneliness and disconnection. While it is good for each person to explore the impacts of their online social worlds on their personal well-being, for many young people the online world is a place to make connections, learn new things, problem solve, and perhaps even increase a student's experience of social support and self esteem. ULifeline is one way that technology is helping students explore their own well-being. This site reports over 10,000 visitors per month, and is customized to help provide resources for over 1,000 campuses. There are many self-screening quizzes that help students identify help for themselves or a friend. The site has many good articles about how to recognize problems and support peers. Many college students are affected by anxiety and depression, but both of these problems are well-researched and improve with talk therapy and/or medication. Since stigma contributes to help-seeking behavior of college students, especially in certain groups, the internet could play a role in normalizing the experiences of help seekers and encourage cognitive awareness about mental health. More research should be done about how well sites that provide mental health information convert self-assessment to actual community-based help for the many college students who report symptoms. Facebook is one online place where many college students spend time. It appears support from Facebook friends may play a role in increasing social capital, well-being, and combating stigma if friends are supportive to online disclosures. However, if you share your life on Facebook check your privacy settings: researchers may try to clinically diagnose your status updates without you ever knowing about it! There is a significant learning curve. Teaching online means learning new programs, getting used to new formats, and keeping everyone up to speed. We are fortunate to have a distance coordinator in our program who is a social worker and also skilled with technology, and she makes sure the students are prepared before they come to our classrooms. Still, when lecturing online I don't have the same cues (nods, laughing at my jokes, blank stares) as I do in a face-to-face classroom, and this is a difficult change. It's ok because there are new kinds of cues: I can ask students to raise their hands, turn on a green light, turn on their cameras or mics to answer a question... it's just a change. Some things are better about distance learning. Talk about diversity of experiences! I have students across the US in my distance classes. Although many of my students are local because we prioritize their admissions, our ND students online get to share a class with more diverse students than they would if they were campus students. For the most part, the students are already in helping professions and are working students with good experience. Because we have a very good and established program we attract high quality students, it makes for a rich classroom experience. A lot of people (students and faculty) have limited technology experience. These are exciting times. If you know how to use technology it is easy to be a leader in its use and to make an impact. For those of you interested in using technology, your skills will be valued and appreciated. Agencies are raising their expectations for technology skills for incoming employees, and if you've been dragging your heels you probably need to think about how to climb on board. It is a nice way to set yourself apart. Technology skills do not replace good teaching. Sometimes technology stands in the way of good teaching. Although I've enjoyed the way that I could bring distance guest speakers to the classroom online, use youtube to demonstrate what someone with a particular diagnosis looks like, or use a blog to share research information, all of these things are clutter if not backed up by good teaching practice. And too much fidgeting with technology is a real distraction in the classroom. I taught in our on-campus program this semester and had an amazing group of students. We made good use of technology, but our classroom discussions were rich and rewarding. I am very proud of the work students have done to help launch this intervention blog where they each explain a brief intervention technique; I hope the blog will continue to grow as I teach the class in future semesters. I am taking a summer technology workshop in May where I will get to learn about some more specific programs and work on classroom prep. My goal is to move more of my lecture to pre-recorded video so we can spend additional time in the classroom in role plays, discussions, vignettes, and practice. This is scary and exciting because it is harder to engage in practice exercises than to review theory, but I am ready for the challenge and hope that I can bring the students along successfully. I look forward to growing and stretching and learning new things. The opportunity to innovate is one of the most exciting things about working at a university. Child welfare workforce turnover- what's the problem? I have dedicated the last several years of my research career to studying the problem of child welfare workforce turnover. High turnover of frontline child welfare workers is a national (and international) problem. The average stay of a child welfare worker in the US is about 2.5 years. So what's the problem? 1. It takes workers time to learn system issues and effective practice. Some research suggests it takes about 2 years. If workers leave just as they are learning the job, they are taking what they've learned with them, and clients are often served by newer workers. 2. Turnover is expensive. It can cost about $35,000-$50,000 in direct costs (training, advertising, recruitment, payout of earned time) each time a worker leaves. This cost impacts the budget of agencies who could be spending the money for more direct services to families or perhaps even preventative services. If a small office loses 10 workers per year, this could be $500,000 in funds that are used to replace workers instead of serve children. 3. Turnover is contagious. When a worker leaves, it places a workload burden on other workers. 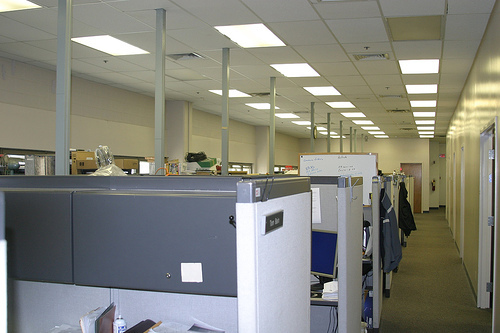 Studies show that turnover and the associated poor morale can be contagious in agencies. 4. Turnover impacts the vulnerable clients that child welfare agencies serve. Often children involved in child welfare have a history of unstable relationships, seperation, and loss, and worker turnover heightens this experience. Children in care report that they have a harder time trusting social workers because of turnover, and even feel responsible for workers leaving the agency. 5. Turnover is linked to lengthened time to permanency. When a new worker gets a case, she has to learn the history and about the family. There may be gaps in services when workers change (before a new worker picks up the case). This may mean that it takes more time before children are safely returned home or until they can be adopted. Although some research has focused on the qualities of an individual worker that might lead them to be more committed or the ways that agencies can train workers in efficiency, my research has focused on the things that child welfare organizations (often governmental agencies) can do differently to better retain workers. Ultimately, changing organizations to better support workers will be more effective than changing individual workers to deal with dysfunctional organizations. In a later post I will talk about some of the organizational predictors of turnover and the things agencies can do to support workforce stability, as well as the people and organizations working on solutions to this problem.